Whatever the media depiction, Bernie Sanders’s first presidential campaign rally was attended by large numbers of women and people of color. We talked to some of them about why they support Bernie. He contrasted this upbringing to Donald Trump’s: Trump was handed a $200,000 a year allowance, even as a child, while Bernie was given 25 cents a week. As a young man Trump built a fortune on housing discrimination, while Bernie protested it. Trump became famous for going on television and telling workers, “You’re fired,” while Bernie grew up in a house and community where people understood the extreme and unfair power that employers have over their employees’ lives. “I know where I come from,” said Bernie. In my conversations with attendees, his story seemed to resonate deeply. Attendees mentioned the Green New Deal, criminal justice reform, and a $15 minimum wage to me, but free college and Medicare for All came up over and over again. In the line for the event, which wrapped around an entire city block, I spotted a teenager holding a sign that said “College for Everyone.” Ellie Gates is seventeen, and was there with her father Alan. “As a college student, I like the idea of free college education,” said Sarah Patt, a nineteen-year-old New York University student from Chicago. 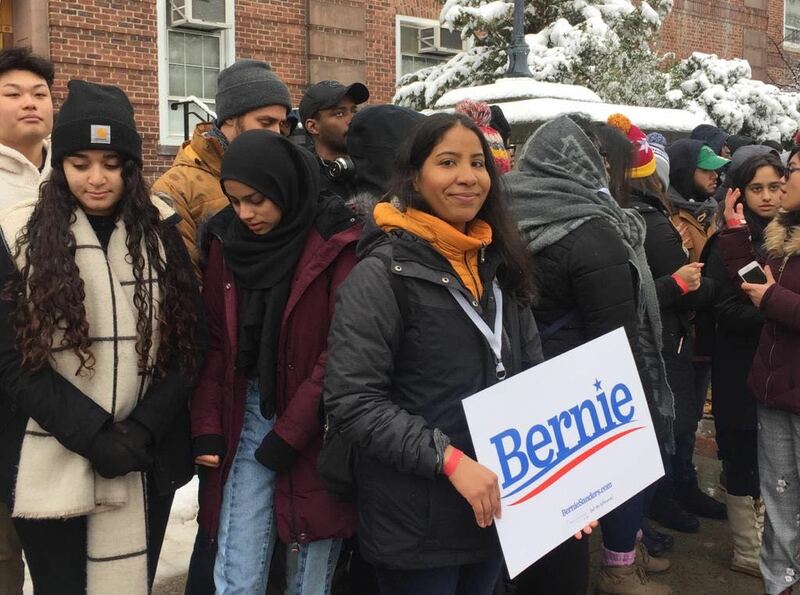 Raul Hernandez, a twenty-nine-year-old from Elizabeth, New Jersey, whose family are immigrants from Colombia and Cuba, told me, “With Bernie, I understand why he aims his critique at the top. Especially me being a minority in America, there are issues in our communities but they’re issues that could be fixed with money. And we don’t have a lot of it. Bryan O’Callahan shoveled snow as he talked to me. The thirty-three-year-old special education preschool teacher from Inwood arrived early for the event, mingled with volunteers near the entrance, and decided on the spot to become one himself. “I think Bernie Sanders providing a credible alternative to Hillary Clinton’s candidacy really showed the American public that after eight years of a very moderate center-right corporate administration under Obama, there was actually an alternative line of thought to the neoliberal program over the last forty years,” he said. Attendees also told me that Bernie inspired them to participate in politics themselves, to see themselves as powerful agents capable of affecting positive change. “I wasn’t always involved in politics,” said Eskandary, one of the Brooklyn College students. “I was afraid of it kind of. It seemed overwhelming. But over time I just started reading more and realizing that this affects every single human being alive. Everything that happens will affect me, even if it’s happening above and I don’t feel it.